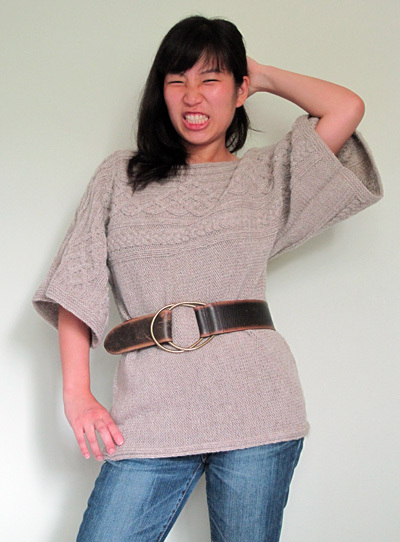 Who says boxy sweaters can’t be fun and fashionable? 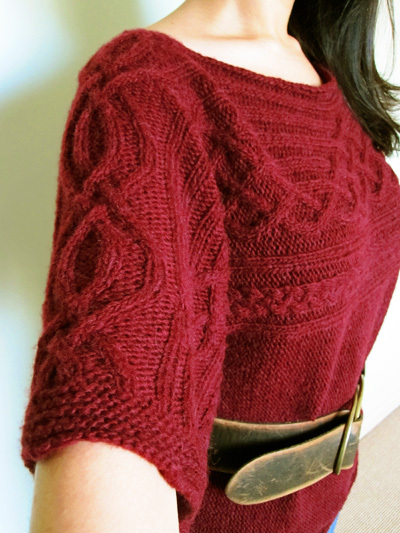 This sweater is great for a beginner who wants to venture into the world of cables. Knit cuff to cuff in one piece, it requires only two side seams to be sewn at the end. The boxiness of the sweater is accentuated with the kimono sleeves and boatneck, while the horizontal cable pattern adds visual interest. 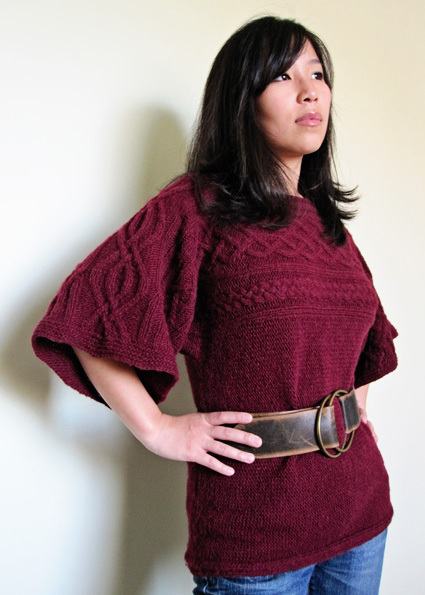 Wear it as is or add a wide belt for a more fitted work without the shaping! C3BP: Slip next st to cable needle and hold to back of work; k2 from left needle, p1 from cable needle. C3FP: Slip next 2 sts to cable needle and hold to front of work; p1 from left needle, k2 from cable needle. C4B: Slip next 2 sts to cable needle and hold to back of work; k2 from left needle, k2 from cable needle. C4F: Slip next 2 sts to cable needle and hold to front of work; k2 from left needle, k2 from cable needle. Instructions for the Cable Cast On can be found here. Click the chart name below and print the resulting page. Using smaller needle, CO 110[116, 120, 126, 130, 136, 140]. Work 9 rows in garter st (k all sts). Important: When working Set-up Row, work Row 12[4, 48, 42, 34, 30, 22] of Charts B, C and D, and Row 4[4, 4, 2, 2, 2, 2] of Chart A.
Set-up Row [WS]: K4[7, 9, 12, 14, 17, 19], place marker, work Chart A over next 16 sts, place marker, work Chart B over next 24 sts, place marker, work Chart C over next 22 sts, place marker, work Chart D over next 24 sts, place marker, work Chart A over next 16 sts, place marker, k4[7, 9, 12, 14, 17, 19]. From this point, work sts at beginning and end of row in reverse stockinette st, and work all other sts following charts as set, beginning with Row 13[5, 1, 43, 35, 31, 23] of Charts B, C and D, and Row 1[1, 1, 3, 3, 3, 3] of Chart A. Work 54[57, 57, 58, 61, 61, 64] rows in pattern, ending with Row 18[13, 9, 4, 47, 43, 38] of Charts B, C and D. Work measures approx. 10.5[11, 11, 11, 11.5, 11.5, 12] inches from beginning. When casting on sts for the lower body in the next step, use cable cast on technique (see Pattern Notes). Next Row [RS]: CO 60 sts, k2, p2, k2, place marker, p to next marker, work in pattern to end. Next Row [WS]: CO 60 sts, p2, k2, p2, place marker, k to next marker, work in pattern to last marker, p2, k2, p2. 230[-, -, 246, -, -, 260] sts. 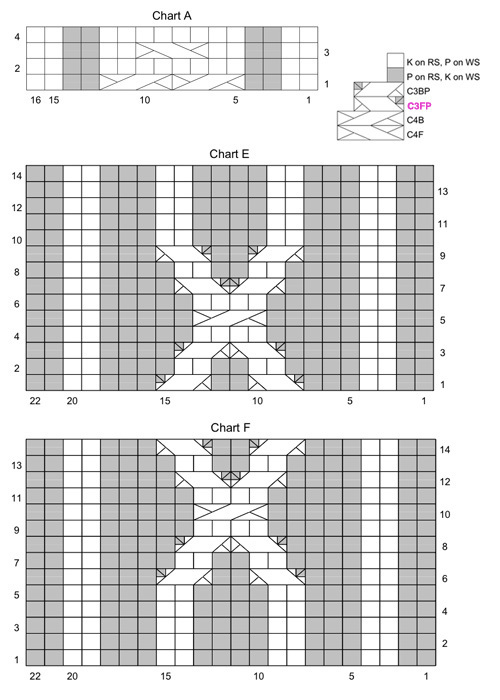 Next Row [WS]: CO 60 sts, p2, k2, p2, place marker, k to next marker, work in pattern to end. Next Row [RS]: CO 60 sts, k2, p2, k2, place marker, p to next marker, work in pattern to last marker, k2, p2, k2. -[236, 240, -, 250, 256, -] sts. From this point, work first and last 6 sts in 2x2 rib as set, work sts of lower body in reverse stockinette st, and maintain cable panels as set. Work 6[11, 15, 20, 25, 29, 34] rows in pattern, ending with Row 26 of Charts B, C and D.
Work 14[13, 12, 12, 11, 10, 9] more rows in pattern, EXCEPT work Chart E over center 22 sts instead of Chart C. End with Row 14[13, 12, 12, 11, 10, 9] of Chart E.
Next Row [WS]: Work in pattern to fourth marker (beginning of Chart E), k2, p2, k3, p2; attach second ball of yarn, BO 4 sts, p1 (2 sts on right needle after bound off sts), k3, p2, k2, work in pattern to end. 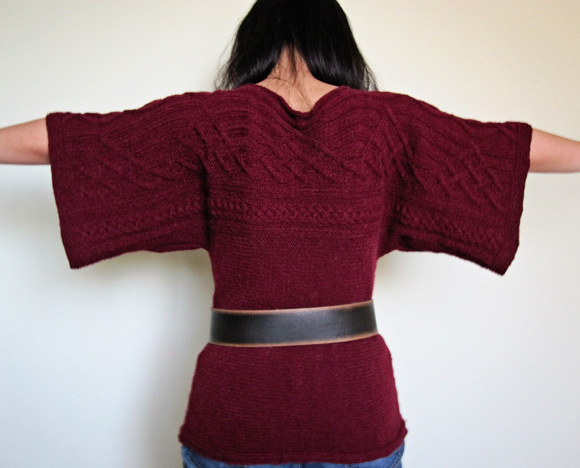 Two sets of 113[-, 118, 121, -, 126, -] sts form front and back of sweater. Next Row [RS]: Work in pattern to fourth marker (beginning of Chart E), p2, k2, p3, k2; attach second ball of yarn, BO 4 sts, k1 (2 sts on right needle after bound off sts), p3, k2, p2, work in pattern to end. 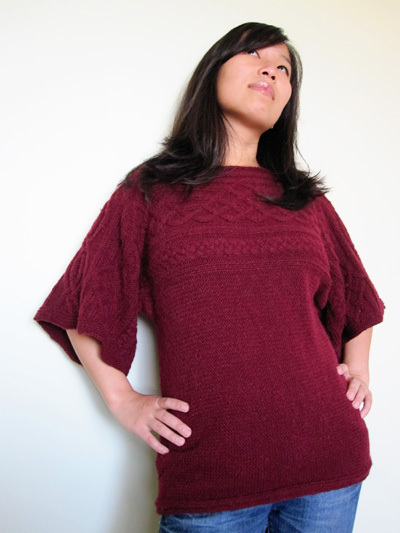 Two sets of -[116, -, -, 123, -, 128] sts form front and back of sweater. You will have just completed Row 41[40, 39, 39, 38, 37, 36] of Charts B and D.
Working both front and back sets of sts at the same time with attached balls of yarn, work 59[61, 63, 63, 65, 67, 69] rows in pattern, ending with Row 4[5, 6, 6, 7, 8, 9] of Charts B and D. Work measures approx. 9.5[9.75, 10, 10, 10.5, 10.5, 11] inches from bound off neckline sts. Next Row: Work first set of sts in pattern, CO 4 sts using cable cast on; using same ball of yarn, continue in pattern across second set of sts. 230[236, 240, 246, 250, 256, 260] sts. Break yarn connected to second ball. Note: For Chart F, unlike the other charts for this pattern, odd-numbered rows are WS rows. 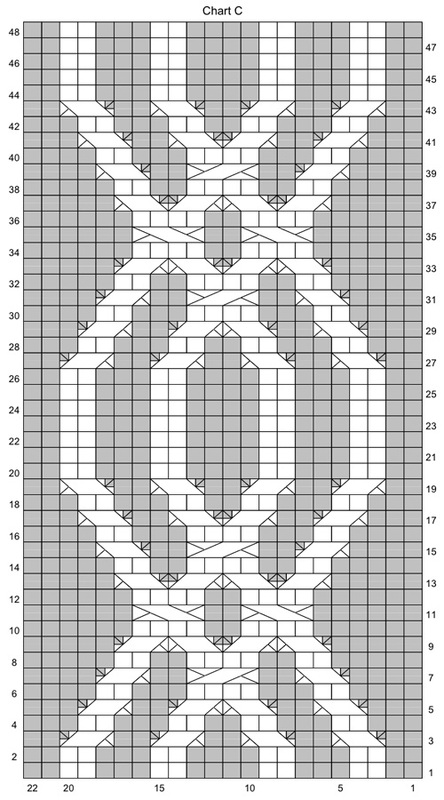 Next Row: Work all sts in pattern, working Row 1[2, 3, 3, 4, 5, 6] of Chart F over center 22 sts. Work 13[12, 11, 11, 10, 9, 8] more rows in pattern, ending with Row 14 of Chart F and Row 19 of Charts B and D. On the next row, resume working Chart C over center 22 sts, beginning with Row 20. 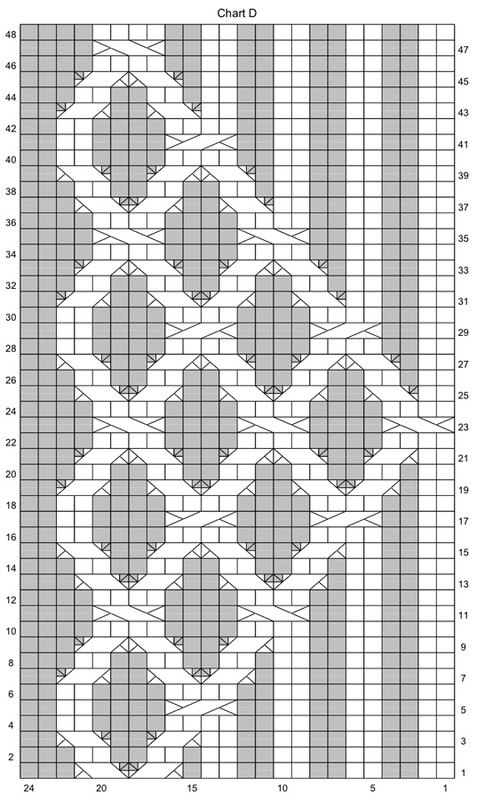 Work 7[12, 16, 21, 26, 30, 35] more rows in pattern, ending with Row 26[31, 35, 40, 45, 1, 6] of Charts B, C and D.
BO 60 sts at beginning of next 2 rows. 110[116, 120, 126, 130, 136, 140] sts. 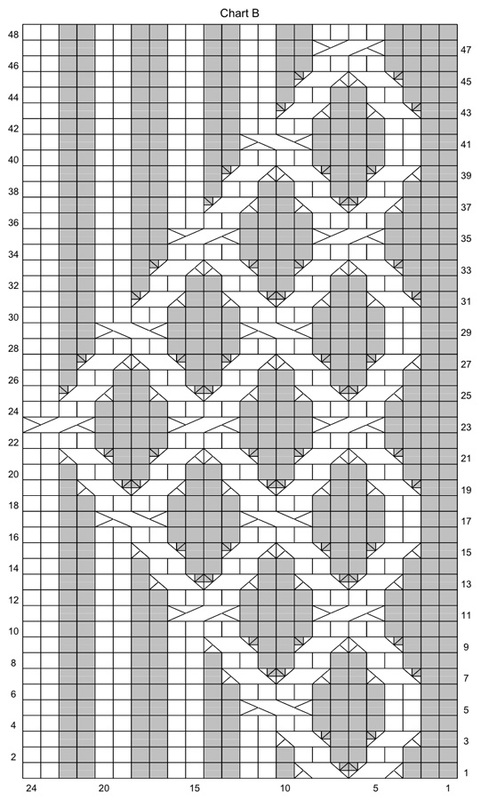 Work 54[56, 56, 58, 61, 61, 64] rows in pattern, ending with Row 34[42, 46, 4, 12, 16, 24] of Charts B, C and D.
Using smaller needle, work 9 rows in garter st. BO all sts. 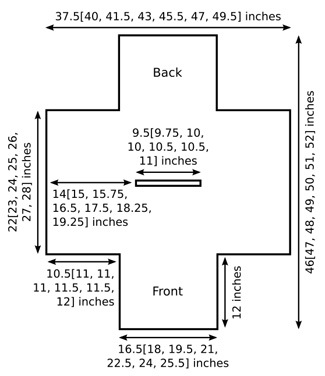 Block to measurements shown in schematic. Sew side seams and sleeve seams. Weave in ends. 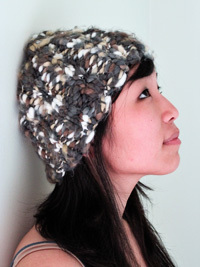 Her knitting and other crafty projects can be found on her blog.